Hi all, Oliver here, with an update on the new features in our latest alpha build! Steve’s been hard at work on the Culture and Idea systems – aspects of your population which affect many different systems in-game. The Ideas system revolves around eleven different hot-button issues of the 31st century – from tolerance of genetically-engineered human subspecies, to trust in technology, to the proper attitude to war – and each individual Pop and character has their own opinion on each one. This, in turn, affects their support for different Projects, Reforms, and other actions you can undertake – giving each of your decisions political ramifications. You may find you need to soften up a particular constituency with propaganda before you push through a particularly unfashionable Reform, or throw them a bone afterwards to placate their dissatisfaction; perhaps a character you need to run your grand Project is an implacable ideological opponent of it, forcing you to find a way to seduce or blackmail them into getting the job done. The Ideas display is visible in the top-right. The average is shown by the idea names; the graphics below, not yet implemented, will show the distribution of Pops’ positions across the spectrum on the planet, system or province selected. The main determinant of a Pop or Character’s Ideas is their Culture. 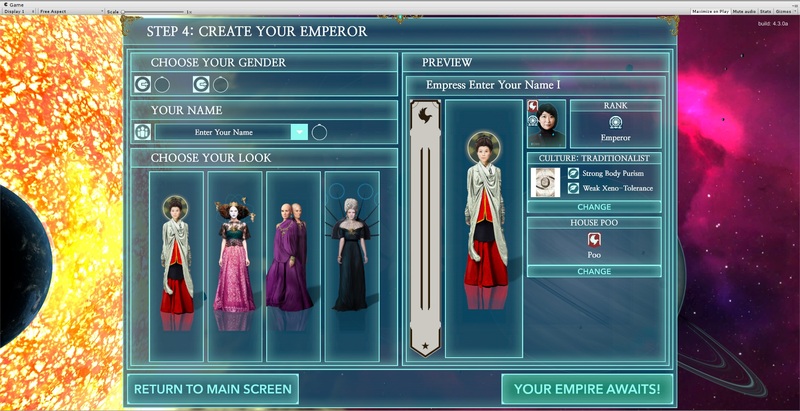 Human Space contains many diverse ways of life, with their own traditions, names, styles of dress, and so on – each of which is represented in-game with unique character names and portraits, ranges of Ideas, unique Reforms that can be implemented once that Culture is integrated into your empire, and more. But Cultures are not passive entities – there can be inter-cultural and inter-religious tensions on your worlds, leading to conflict and even full-on civil war. You must carefully consider how best to resolve these situations as you lead the Celestial Empire. Cultures displayed on the system screen. Note the leftmost planet box shows the placeholder graphic we used before implementing the system, while the other three show the actual cultural breakdown. Full details on all the cultures on a planet are shown on the planet screen. Alongside these systems, we’ve been hard at work polishing up our existing ones, creating content to plug into the game, and more. Next week, we’ll have a video update for you. Until then, Ave Imperator! Previous post: Progress report from the developer!